I saw the commercial for this Zero Water Filter system and I was immediately engaged. I’m sure you saw it too? They pour red dye into the water and the filter clears it out in an instant. If it can take out a liquid color made if tiny particles, what else could it remove? To make it even better they GIVE you a water testing system so you can check as you go! 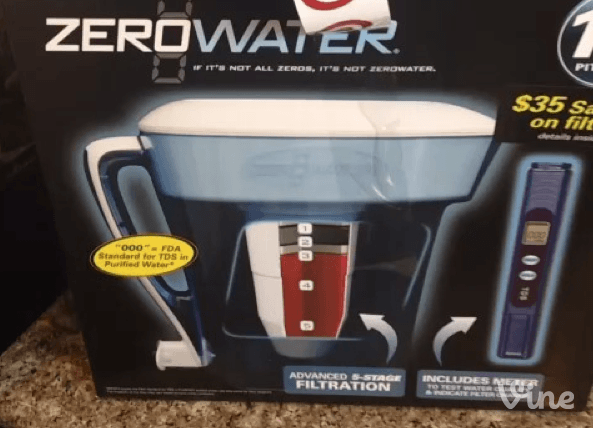 So I fell for the awesome commercial and bough the Zero Water Filter system. Opened it up and set it up in an instant (very easy). I tested my tap water FIRST. It has a whopping 253 (more then even the worst image on the box that had a reading of 128, EEK). After filtering water I checked again and it was down to a 53 TDS. I emptied the glass, wiped it clean, then tested again (residue from soap and the dish washer can increase the reading). It read 13 TDS and I was satisfied with my purchase. However, after using the device for a week I decided to put together a pros and cons review of the zero water filter for people who may be considering it. You MUST read it before you decide to buy!!! Water tastes clean. I will have to admit that my other filter left me wondering because the taste of the water wasn’t as clean as bottled water. Easy water bottle dispenser spout allows you to fill a cup or container directly from the fridge. Filtration reads lower then purified water from bottled water. The awesome water bottle spout LEAKS! After using this, loving this and posting it on the site, I am sad to say that I have to return it 🙁 I love the great filtering process, the water tastes great BUT the spout leaks all over the fridge! I tried sveral things to get it to stop but it’s impossible. I will now be looking for another version of the Zero Water Filter without the spout on the bottom of the pitcher (if those exist).